There are some today who mistakenly believe that if they can show a family genealogy that traces back to a Hawaiian ali‘i (nobility) they can lay claim to the throne. If this were true than anyone can lay claim. But it is not true because the Hawaiian Kingdom is a constitutional monarchy that provides rules and protocol. 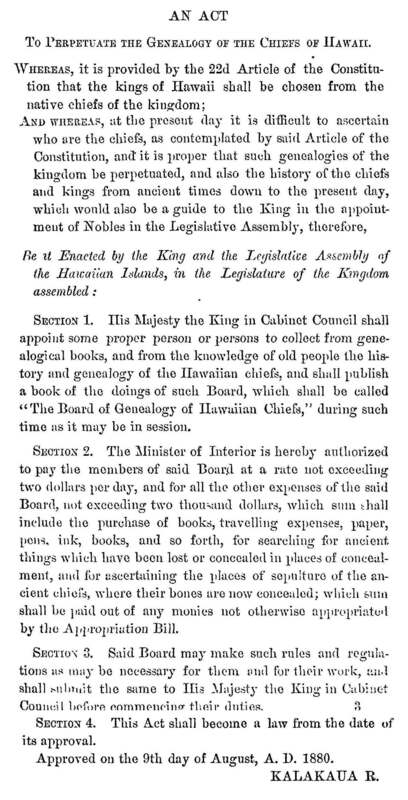 This provision is further elaborated under §768, Hawaiian Civil Code (Compiled Laws, 1884), “The Legislative Department of this Kingdom is composed of the King, the House of Nobles, and the House of Representatives, each of whom has a negative on the other, and in whom is vested full power to make all manner of wholesome laws, as they shall judge for the welfare of the nation, and for the necessary support and defense of good government, provided the same is not repugnant or contrary to the Constitution.” As each Estate has a negative on each other, no law can be passed without all three Estates agreeing. The number of the Representatives of the people in the Legislature shall be twenty-eight: eight for the Island of Hawai‘i (one for the district of North Kona, one for the district of South Kona, One for the district of Ka‘u, one for the district Puna, two for the district of Hilo, one for the district Hamakua, one for the district of Kohala); seven for the Island of Maui (two for the districts of Lahaina, Olowalu, Ukumehame, and Kaho‘olawe, one for the districts of Kahakuloa and Ka‘anapali, one for the districts of Waihe‘e and Honuaula, one for the districts of Kahikinui and Ko‘olau, one for the districts of Hamakualoa and Kula); two for the Islands of Molokai and Lanai; eight for the Island of O‘ahu (four for the districts of Honolulu that extends from Maunalua to Moanalua, one for the districts of Ewa and Waianae, one for the district of Waialua, one for the district of Ko‘olauloa, and one for the district of Ko‘olaupoko); and three for the island of Kaua‘i (one for the districts of Waimea, Nualolo, Hanapepe and the Island of Ni‘ihau, one for the districts of Puna, Wahiawa and Wailua, and one for the districts of Hanalei, Kapa‘a and ‘Awa‘awapuhi) (§780, Compiled Laws). The first constitution of the Hawaiian Kingdom was promulgated in 1840 by King Kamehameha III, which was superseded by the 1852 Constitution. Article 25 of the 1852 Constitution provided: “The crown is hereby permanently confirmed to His Majesty Kamehameha III. during his life, and to his successor. The successor shall be the person whom the King and the House of Nobles shall appoint and publicly proclaim as such, during the King’s life; but should there be no such appointment and proclamation, then the successor shall be chosen by the House of Nobles and the House of Representatives in joint ballot.” Kamehameha III proclaimed his adopted son, Alexander Liholiho, to be his heir apparent after receiving confirmation from the Nobles in 1853. Alexander ascended to the Throne upon the death of King Kamehameha III on December 15, 1854. In 1864, a new constitution was promulgated by King Kamehameha V, and Article 22 of the 1864 Constitution provides that, “The Crown is hereby permanently confirmed to His Majesty Kamehameha V. and to the Heirs of His body lawfully begotten, and to their lawful Descendants in a direct line; failing whom, the Crown shall descend to Her Royal Highness the Princess Victoria Kamamalu Kaahumanu, and the heirs of her body, lawfully begotten, and their lawful descendants in a direct line. 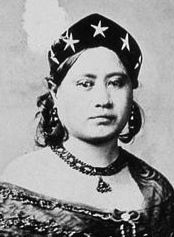 The Succession shall be to the senior male child, and to the heirs of his body; failing a male child, the succession shall be to the senior female child, and to the heirs of her body.” Princess Kamamalu died on May 29, 1866 without any lineal descendants, leaving the successors to the Throne solely with King Kamehameha V.
Since Kamehameha V had no children, Article 22 of the 1864 Constitution provides that a “successor shall be the person whom the Sovereign shall appoint with the consent of the Nobles, and publicly proclaim as such during the King’s life; but should there be no such appointment and proclamation, and the Throne should become vacant, then the Cabinet Council, immediately after the occurring of such vacancy, shall cause a meeting of the Legislative Assembly, who shall elect by ballot some native Ali‘i of the Kingdom as Successor to the Throne.” The Cabinet Council replaced the function of the Premier (Kuhina Nui) under the former constitution, whose office was repealed by the 1864 Constitution, and according to Article 33 would serve as a Council of Regency. The Legislative Assembly convened again in special session on February 12, 1874 and elected King Kalakaua after Lunalilo, who died without children, failed to appoint a successor. Upon ascension to the Throne, King Kalakaua appointed his brother Prince William Pitt Leleiohoku as his heir apparent and received confirmation from the Nobles. Leleiohoku died April 10, 1877, which prompted Kalakaua to immediately appoint his sister on the same day, Princess Lili‘uokalani, as his heir apparent and he received confirmation from the Nobles. An heir apparent is a person who is first in line of succession to the Throne according to Hawaiian law and cannot be displaced. An heir presumptive, however, is the person, male or female, entitled to succeed to the Throne, but can be replaced by an heir apparent pronounced according to Hawaiian law. When the Legislative Assembly elected King Kalakaua in 1874, a new Stirps had effectively replaced the former Stirps, being the Kamehameha dynasty, with the Keawe-a-Heulu dynasty. Although Lunalilo was an elected King, he was of the Kamehameha dynasty, through Kamehameha’s father, Keoua. Stirps is a direct “line descending from a common ancestor,” and applies to monarchical dynasties. The Stirps for the Kamehameha Dynasty was a direct line from Kamehameha with Keopuolani, being the highest ranking of his wives. 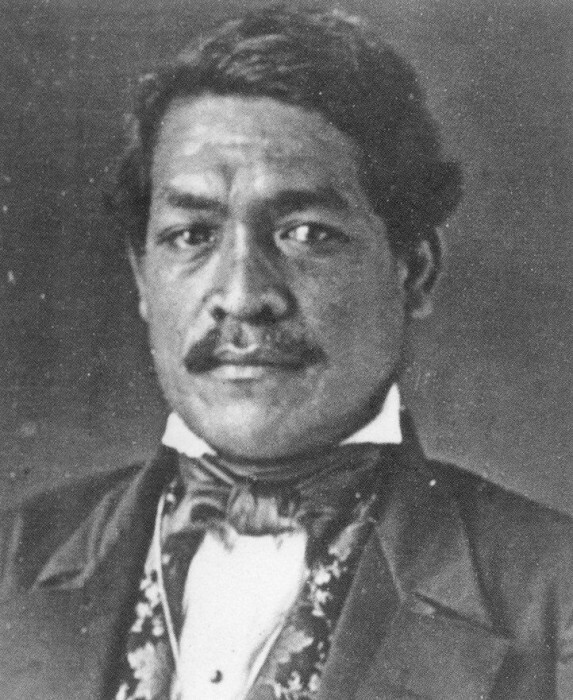 Lunalilo was not a direct descendant of Kamehameha, but a direct descendant of Kamehameha’s father, Keoua, whose son, Kalaimamahu, was Kamehameha’s half-brother. Keawe-a-Heulu was one of the four counselor chiefs to Kamehameha I when the islands were consolidated under one kingdom. The other three counselor chiefs were Ke‘eaumoku, Kamanawa and Kame‘eiamoku. Ke‘eaumoku was the father of Ka‘ahumanu, one of Kamehameha’s wives and who later served as Prime Minister after Kamehameha’s death in 1819. 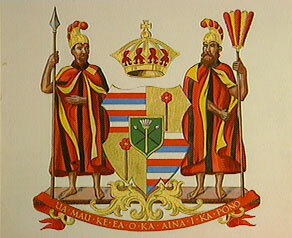 Kamanawa and Kame‘eiamoku were brothers and are also represented in the Hawaiian Kingdom’s coat of arms. The Kamehameha dynasty also included the descendants of Kamehameha’s other wives, other than Keopuolani who was the mother of Kamehameha II and III, and the young Princess Nahienaena. These wives and children included: Peleuli who had Maheha Kapulikoliko, Kahoanoku Kina‘u, Kaiko‘olani and Kiliwehi; Kaheiheimalie who had Kamamalu and Kina‘u, who was the mother of Kamehameha IV and V, and Premier Victoria Kamamalu. 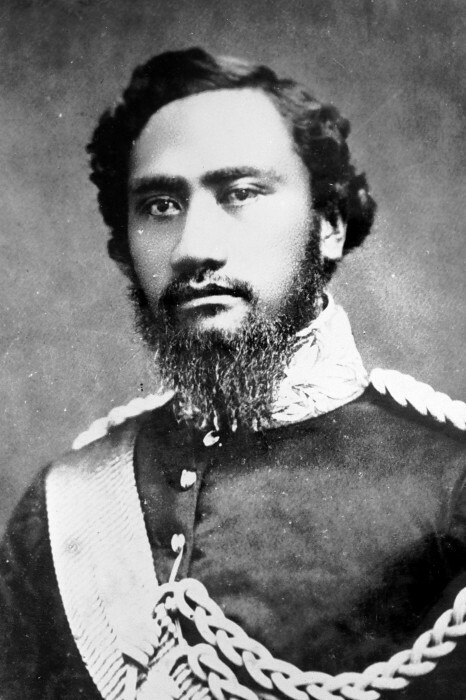 In 1883, the Keawe-a-Heulu Stirps was formally declared at the Coronation of King Kalakaua and Queen Kapi‘olani. Princess Lili‘uokalani as the heir apparent, and the heirs presumptive, being Princess Virginia Kapo‘oloku Po‘omaikelani, Princess Kinoiki, Princess Victoria Kawekiu Kai‘ulani Lunalilo Kalaninuiahilapalapa, Prince David Kawananakoa, Prince Edward Abnel Keli‘iahonui, and Prince Jonah Kuhio Kalaniana‘ole comprised the new royal lineage. 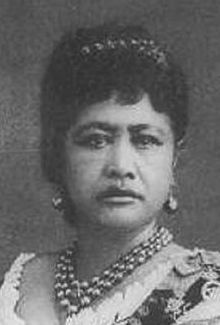 Queen Lili‘uokalani appointed Princess Ka‘iulani as her heir apparent in 1891, but was unable to get confirmation by the Nobles because they were prevented from entering the Legislative Assembly as a result of the so-called 1887 bayonet constitution that began the insurgency. 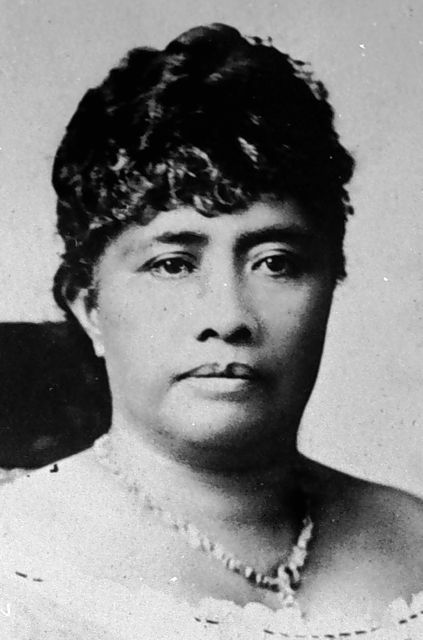 In 1917, Queen Lili‘uokalani died with no such appointment or Proclamation leaving the Throne vacant. After the Queen’s death, only Prince Kuhio was left of the heirs presumptive. All the rest had died. Of the heirs presumptive, only Prince David Kawananakoa died with lineal descendants, but these lineal descendants did not inherit the title of heirs presumptive because they were not proclaimed as such by a reigning Monarch, as King Kalakaua did by proclamation in 1883. While these lineal descendants have no claim to the Throne, they are part of the Estate of the Ali‘i (Chiefs). 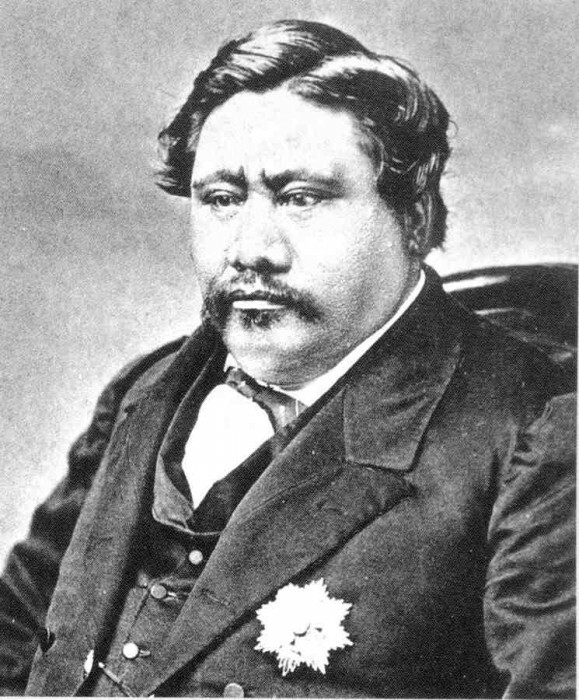 Know all men by these presents, that I, Kamehameha III, by the grace of God, King of the Hawaiian Islands, have given this day of my own free will and have made over and set apart forever to the chiefs and people the larger part of my royal land, for the use and benefit of the Hawaiian Government, therefore by this instrument I hereby retain (or reserve) for myself and for my heirs and successors forever, my lands inscribed at pages 178, 182, 184, 186, 190, 194, 200, 204, 206, 210, 212, 214, 216, 218, 220, 222, of this book, these lands are set apart for me and for my heirs and successors forever, as my own property exclusively. The “book” Kamehameha was referencing the page numbers was the 1848 Buke Mahele also called the Mahele Book. By the said Act, which is entitled “An Act relating to the lands of his Majesty the King and of the Government,” the lands reserved to the then reigning sovereign, descend in fee, the inheritance being limited to the successors to the throne, each successive possessor having the right to dispose of the same as private property. The heirs and successors to the Crown lands are successors to the throne and not the family. In 1864, Kamehameha V asked the Legislature to remove all encumbrances such as mortgage liens on the property that had greatly encumbered the Crown lands. 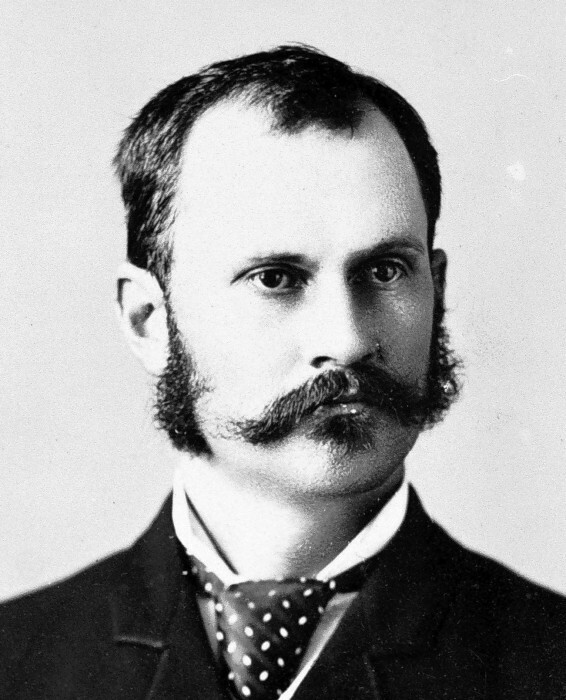 That year on January 3, the Legislature passed An Act to Relieve the Royal Domain from Encumbrances (January 3, 1865).This Act authorized the Minister of Finance to issue government bonds up to $30,000.00, and the money received through the bonds would pay off the debt lenders had on the Crown in order to release the mortgages. After the debts were cleared, the Act made Crown lands inalienable and limited the ownership of tenants to 30 year leases. By making the Crown lands inalienable they were no longer capable of being mortgaged. The Act also established a Board of Commissioners of Crown Lands who collected the lease rent. The Commissioners of Crown Lands managed the purse of the Crown. There was no tax that the people paid for to maintain the office of the Crown. Currently, there are pretenders to the Estate of the Crown. Some claims are well known, while others are not, but all claims to the Crown lands have no basis in Hawaiian law because Her late Majesty Queen Lili‘uokalani did not appoint and thereafter proclaim her successor in accordance with the law as it was done in the past. 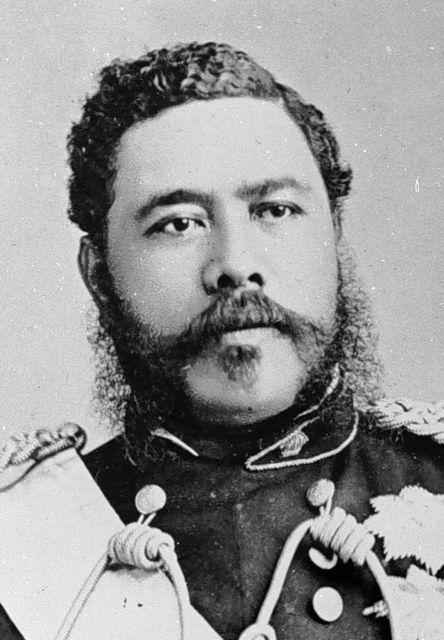 The office of the Crown can only be filled by an election by the Legislative Assembly as it was done in the case of King Lunalilo in 1873 and King Kalakaua in 1874. The political class of Ali‘i is an integral component of the Hawaiian Kingdom and its government and has its origin deeply rooted in Polynesian society. The entire land system of the Kingdom that continues to exist today is grounded and based on actions taken by the Ali‘i such as the granting of Royal Patents, Land Commission Awards, and the Great Land Division (Mahele) between the Government and Chiefs, which also set the terms of division between both the Government and Chiefs and native tenants desiring to get a fee-simple title to their lands. 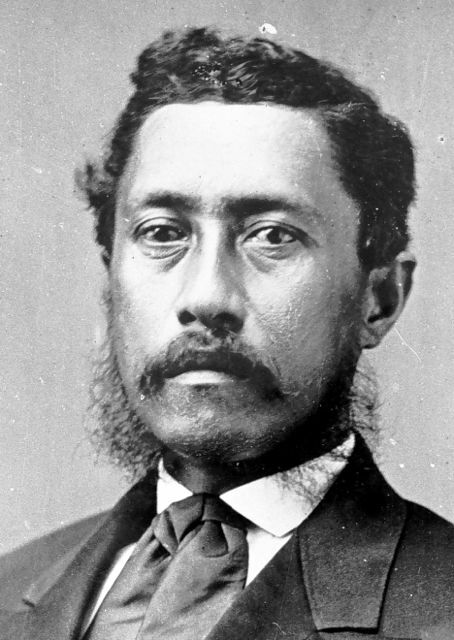 Despite the lack of government funding and the illegal overthrow of the Hawaiian Kingdom government, the Board continued their work to compile the genealogies of Hawaiian Chiefs (Mo‘okua‘auhau Ali‘i) that were eventually published in the Ka Maka‘ainana newspaper in the year 1896. June 1, 1896—Genealogies of King Kamehameha IV and King Lunalilo, both of whom died without lineal descendants. June 8, 1896—Genealogies of King Kalakaua and Queen Liliuokalani, both of whom died without lineal descendants. June 15, 1896—Genealogy of Princess Kaiulani, who died without lineal descendants. June 29, 1896—Genealogies of Queen Kapiolani, who died without lineal descendants; Prince Jonah Kuhio Kalanianaole who died without lineal descendants; and David Kawananakoa. July 6, 1896—Genealogies of William Piikoi Wond, Lydia Kamakee Cummins, and Maraea Cummins; Daisy Napulahaokalani, Eva Kuwailanimamao, Roberto Kalaninuikupuaikalaninui Keoua and Virginia Kahoa Kaahumanu Kaihikapumahana. July 13, 1896—Genealogy of Albert Kekukailimoku Kunuiakea who died without lineal descendants. July 20, 1896—Genealogies of Princess Bernice Pauahi who dies without lineal descendants, Princess Ruth Keelikolani who died without lineal descendants, and John Kamehamehanui who died without lineal descendants. July 27, 1896—Genealogies of Alexandrina Leihulu Kapena who died without lineal descendants, Edward Kamakau Lilikalani, and Annie Palekaluhi Kaikioewa who died without lineal descendants. August 3, 1896—Genealogies of Sabina Kahinu Beckley, Frederick Kahapula Beckley, Jr., and Frederica Beckley; Leander Kaonowailani, Violet Kahaleluhi Kinoole, Grace Namahana i Kaleleokalani, Frederick Malulani, George Heaalii and Benjamin Kameeiamoku; William Kauluheimalama Beckley, Henry Hoolulu Beckley, Juanita Beckley, and George Mooheau Beckley, Jr.; Henry Hoolulu Pitman, Mary Kinoole (Mrs. Mary Ailau), and Benjamin Pitman, Jr.; Robert Hoapili Baker, Henry Kanuha, and Rev. J. Kauhane of Kau. August 10, 1896—Genealogies of William Hoapili Kaauwai, Jr., Luka Kaauwai and Lydia Kahanu Kaauwai; Mary Parker (Mrs. Maguire), Eva Kalanikauleleiaiwi Kahiluonapuaonahonoapiilani Parker, Helen Umiokalani Parker, John Palmer Parker, Hattie Kaonohilani Parker, Palmer Kuihelani Parker, Samuel Keaoililani Parker, Ernest Napela Parker, and James Kekookalani Parker. August 17, 1896—Genealogies of Lydia Kamakanoe Kanehoa, Albert Kaleinoanoa Kanehoa, Jno Kupakee Kanehoa, Davida K. Hoapili Kanehoa, and Maria Kalehuaikawekiu Kanehoa; Hoapiliwahine-a-Kanehoa; and the children of Makainai-a-Kuakini and Kauina, being Jesse Makainai, Keeaumoku, Kapaleiliahi, Kaumaumaeha, Hoapili Liilii, and Paulo Hoapili; Henry St. John Kaleookekoi Nahaolelua, George William Lua Nahaolelua, John Vivian St. John Kapokini Nahaolelua, Charles Kalaninoheainamoku Nahaolelua, Albert Kamainiualani Nahaolelua, Alexander Pahukula Kuanamoa Nahaolelua, Elizabeth Alice Kalakini Nahaolelua, and Emma Rhoda Kaaiohelo Nahaolelua; William Kapahukula Enelani Stevens who died without lineal descendants, and Keliikui Stevens who also died with lineal descendants. August 24, 1896—Genealogies of Rose Kekupuohi Simerson, William Kuakini Simerson and Isaac Kaleialii Simerson; and the children of Annie Niulii and Kahaleaahu, being Helen Kalolowahilani, John Paalua and David Kauluhaimalama. 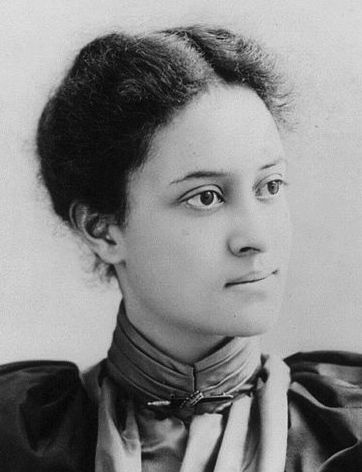 August 31, 1896—Genealogies of Annie Thelma Kahiluonapuaonahonoapiilani Parker; Kahaule-o-Kuakini and Mrs. Maluhi Reis; John Meek, Jr.; and Maraea Kaoaopa died without lineal descendants. September 7, 1896—Genealogies of Adele Mikahala Unauna, John Koii Unauna, Maraea Kapumakokoulaokalani Unauna, Kaniu Unauna, Kahelemanolani Unauna, Jane Kulokuloku Unauna, Hattie Kaauamookalani Unauna and James Kalimaila Unauna; Julia Kailimahuna Koii, Lydia Kahuakai Koii, Lydia Kahuakai Koii, David Koii who died without lineal descendants, and Esther Namahana Koii; Julia Kapakuialii Kalaninuipoaimoku Doiron and Moses Koii Luhaukapewa Doiron; William Kahoapili Kekohimoku Alohikea, Alfred Unauna Alohikea, David Kauahiaalaiwilani Kaili; Alexander Boki Reis, Palmyra Lonokahikini Reis, and Helen Kekumualii Reis; and Helina Kaiwaokalani Maikai, David Unualoha Maikai, Samuela Kahilolaamea Maikai, and Abigaila Kalanikuikepo‘oloku Maikai. October 5, 1896—Genealogies of Stella Keomailani Cockett who died without lineal descendants; and the child of Kekulu and Kaiakoili, being David Kalani. October 19, 1896—Genealogies of Tilly Kaumakaokane Cummins, Thomas Keauiaole Cummins, and John T. Walker Cummins; King Keaweaua Mersberg, James Kahai Mersberg, Jr., Lily Kahalewai Mersberg, Marie Mersberg, Lydia Mersberg, Jane Piilani Mersberg, and Charles Mersberg; John Adams Kaenakulani Cummins, Thomas C. Kaihikapu Cummins, and Raplee Kawelokalani Cummins; May Kaaolani Cummins Creighton; Flora Kahanolani Cummins; children of Kekupuo-i; Ponilani Kaiama (w), Margaret Loe Kaiama, Esther Nahaukapuokalani Kaiama, Levi Kaiama and Keliimaikai Kaiama; Grace Kamaikui Piianaia, Niaupio Piianaia, and Heulumanawaokalani Piianaia (k); Phoebe Ulualoha Wilcox; and Daniel Kekuhio Keliiaa and Kekukamaikalani Keliiaa. October 26, 1896—Genealogy of Katherine Kaonohiulaokalani Brown who died without lineal descendants. November 2, 1896—Genealogy Hana Kaunahi and Akahi who both died without lineal descendants. After the death of Prince Kuhio Kalaniana‘ole on January 13, 1922, the Associated Press reported, “Fourteen chiefs selected by the committee from the high chiefs of Hawaii will bear the casket of Prince Kuhio at the funeral Sunday morning. The selection are Henry P. Beckley, Edwin Kea, David Hoapili, Sr., Kaliinonao, John Nahaolelua, Alex Nahaolelua, Jesse Makainai, William Simerson, John H. Wise, William Taylor, Geo. Kalohapauole, David Maikai, Ahapuni Boyd, Clement Parker, Samuel Parker, Jr., as bearer of orders and David Hoapili, Jr. as bearer of the tabu stick.” These men were selected from the Estate of Ali‘i (Chiefs). Any person today who is a direct lineal descendant of the Hawaiian Chiefs identified in these published genealogies belong to the Estate of Nobles (Chiefs), and are eligible to be appointed as Nobles in the Legislative Assembly and/or to the Throne in accordance with Hawaiian law. Any person today who is a direct lineal descendant of a Hawaiian subject before the United States occupation began on January 17, 1893, belong to the Estate of the People. The article is a departure from the common belief that Hawai‘i is the 50th State of the American Union. Instead, Hawai‘i is an independent State that has been under an illegal and prolonged occupation by the United States since January 17, 1893. The significance of this article is that the NEA has taken a position based on historical facts and not political leanings. 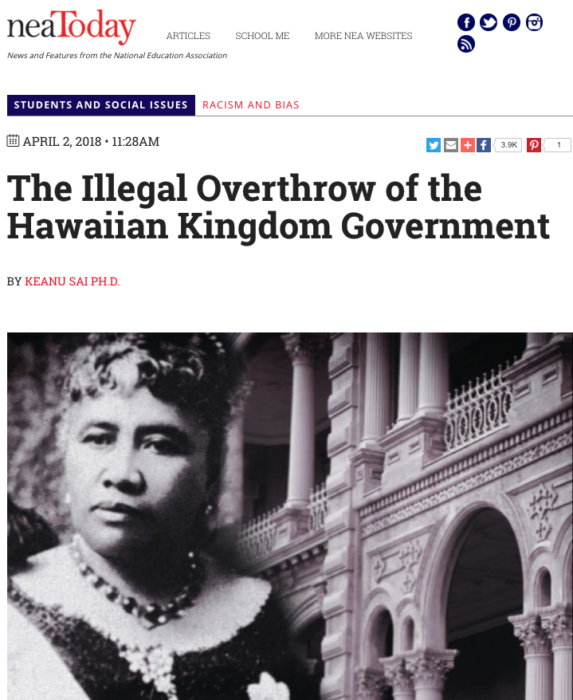 The article will be referenced by teachers across the United States that explains to their students the lawful status of the Hawaiian Kingdom under international law. 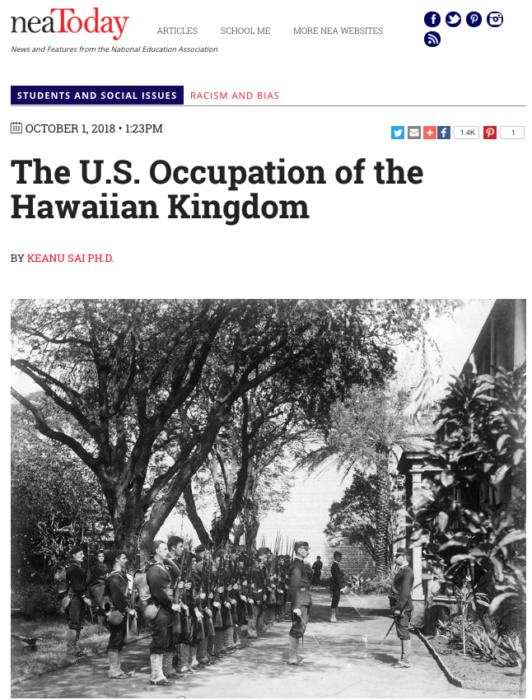 The NEA will publish an article that documents the illegal overthrow of the Hawaiian Monarchy in 1893, the prolonged occupation of the United States in the Hawaiian Kingdom and the harmful effects that this occupation has had on the Hawaiian people and resources of the land. 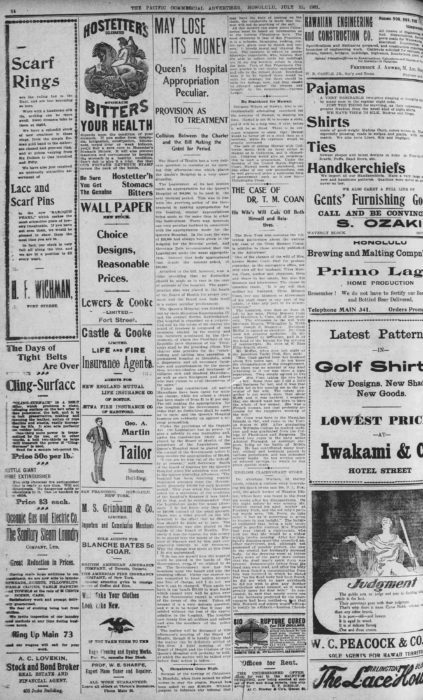 The article below was printed on page 14 of The Pacific Commercial Advertiser on July 31, 1901 in Honolulu. 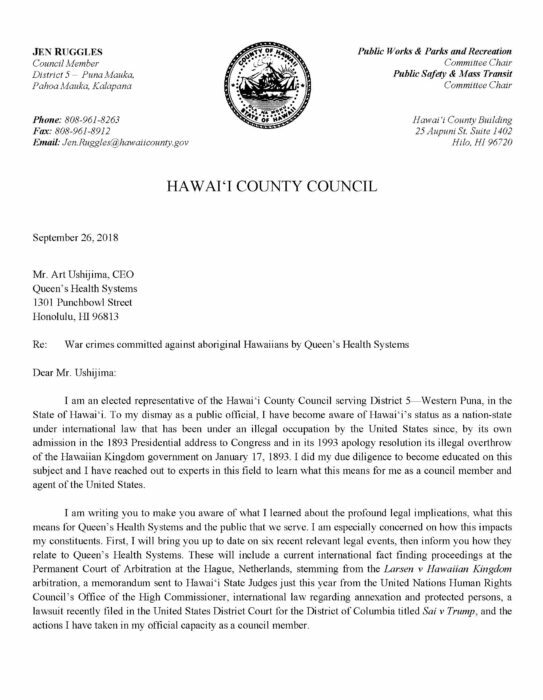 It is a window into a time of colliding legal systems and the Queen’s Hospital would soon become the first Hawaiian health institution to fall victim to the unlawful imposition of American laws. Queen’s Hospital was established as the national hospital for the Hawaiian Kingdom and that health care services for Hawaiian subjects of aboriginal blood was at no charge. 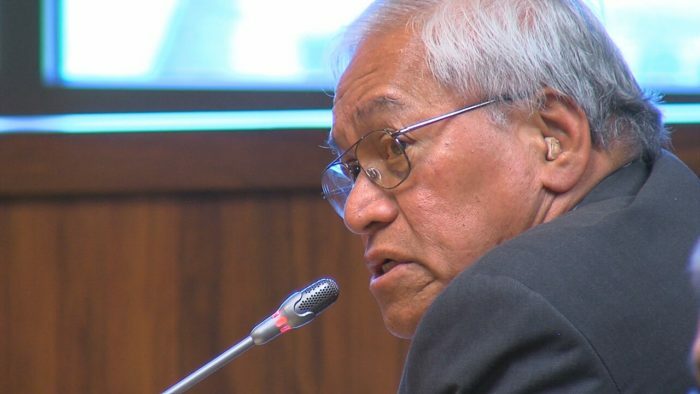 The Hawaiian head of state would serve as the ex officio President of the Board together with twenty trustees, ten of whom were from the Hawaiian government. Since the hospital’s establishment in 1859 the legislature of the Hawaiian Kingdom subsidized the hospital along with monies from the Queen Emma Trust. With the unlawful imposition of the 1900 Organic Act that formed the Territory of Hawai‘i, American law did not allow public monies to be used for the benefit of a particular race. 1909 was the last year Queen’s Hospital received public funding and it was also the same year that the charter was unlawfully amended to replace the Hawaiian head of state with an elected president from the private sector and reduced the number of trustees from twenty to seven, which did not include government officers. 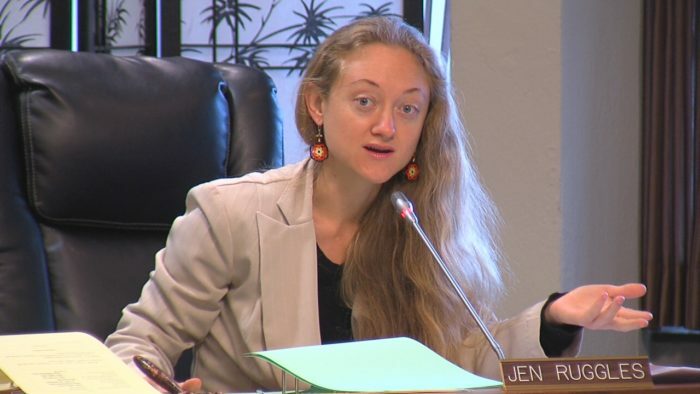 These changes to a Hawaiian quasi-public institution is a direct violation of the laws of occupation, whereby the United States was and continues to be obligated to administer the laws of the occupied State—the Hawaiian Kingdom. This requirement comes under Article 43 of the 1907 Hague Convention, IV, and Article 64 of the 1949 Geneva Convention, IV. Article 55 of the Hague Convention provides, “The occupying State shall be regarded only as administrator and usufructuary of public buildings, real estate, forests, and agricultural estates belonging to the [occupied] State, and situated in the occupied country. It must safeguard the capital of these properties, and administer them in accordance with the rules of usufruct.” The term “usufruct” is to administer the property or institution of another without impairing or damaging it. Despite these unlawful changes, aboriginal Hawaiian subjects, whether pure or part, are to receive health care at Queen’s Hospital free of charge. This did not change, but through denationalization there was an attempt to erase. 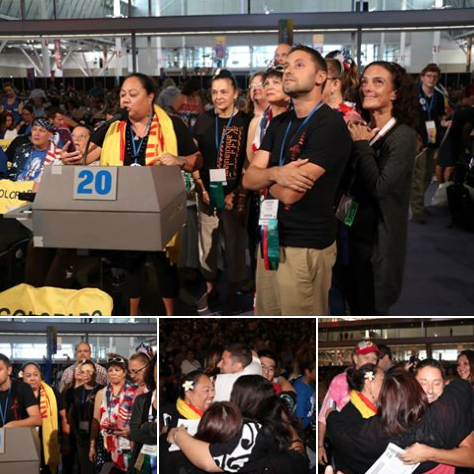 Aboriginal Hawaiian subjects are protected persons as defined under international law, and as such, the prevention of health care by Queen’s Hospital constitutes war crimes. Collision Between the Charter and the Bill Making the Grant for Period. The Board of Health has a very delicate question to consider at its meeting this afternoon—one which places the Queen’s Hospital in a very queer situation. The Legislature at its last session made an appropriation for the Queen’s Hospital of $40,000, to be used in the next biennial period. This was in line with the previous policy of the Government in making appropriation for the hospital, similar appropriations being made at the same time to other like institutions. There was, however, one very peculiar incident in connection with the appropriation made for the Queen’s Hospital. In the past the sum of $20,000 had always been given to the hospital for the biennial period, and Governor Dole recommended that the Legislature make the usual appropriation. Instead that body appropriated just double the amount asked, or $40,000. Attached to the bill, however, was a rider providing that no distinction should be made as to race in the care of patients at the hospital. The appropriation was also placed in the hands of the Board of Health for proper payment and the Board now finds itself in a rather peculiar predicament. Under this construction all native Hawaiians have been cared for without charge, while for others a charge has been made of from $1 to $3 per day. The bill making the appropriation for the hospital by the Government provides that no distinction shall be made as to race; and the Queen’s Hospital trustees are evidently up against a serious proposition. Under the provisions of the Organic Act the Legislature has no power to give a subsidy to any institution and, under the construction likely to be placed by the Board of Health of the intentions of the Legislature, the Queen’s Hospital must be placed under the control of the Government before it may receive the appropriation of $40,000. The matter will be discussed at this afternoon’s meeting of the Board of Health, though it is hardly likely that the matter can be definitely settled at this time. A joint meeting of the Board of Health and the trustees of the Queen’s Hospital will probably be held, at which the matter will be talked over before final action is taken. Under this definition, civilians who possess the nationality of the occupying State while they reside in the territory of the occupied State are not protected under the Geneva Convention. Article 147 of the Geneva Convention provides a list of grave breaches, called war crimes, which would apply to protected persons as defined under Article 4. The relevant grave breaches and explanations that would apply to the American occupation of the Hawaiian Kingdom can be found in paragraphs 190 through 205 of the Emergency Petition for Writ of Mandamus filed in federal court in Washington, D.C. If you are a protected person whose situation would fall under one of the explanatory paragraphs in the mandamus, a grave breach or war crime may have been committed against you. Fifty years later, however, this definition of a protected persons was expanded to include the citizenry of the occupying State. This was an evolution of international criminal law ushered in by the Appeals Chamber of the International Criminal Tribunal for the Former Yugoslavia (ICTY). The case was the prosecution and conviction of Duško Tadić who was a Bosnian Serb. After being arrested in Germany in 1994, he faced among other counts, twelve counts of grave breaches of the 1949 Geneva Convention, IV. On May 7, 1997, he was convicted by the trial court on 11 counts but did not include the counts of grave breaches of the Geneva Convention. In paragraph 608 of its judgment, the trial court found that Tadic was not guilty of 11 counts of grave breaches because the civilian victims possessed the same Yugoslavian citizenship as Tadic who represented the occupying Power in the war. The prosecutors appealed this decision and it was not only reversed by the Appeal Chamber of the ICTY, but it also expanded the definition of protected persons in occupied territory under international humanitarian law. “[The] primary purpose [of Article 4] is to ensure the safeguards afforded by the [Geneva] Convention to those civilians who do not enjoy the diplomatic protection, and correlatively are not subject to the allegiance and control, of the State in whose hands they may find themselves. In granting its protection, Article 4 intends to look to the substance of relations, not their legal characterisation as such. … Hence, even if in the circumstances of the case the perpetrators and the victim were to be regarded as possessing the same nationality, Article 4 [Geneva Convention] would still be applicable.” Tadic, ICTY Appeals Chamber, Judgment (1999), para. 168 and 169. 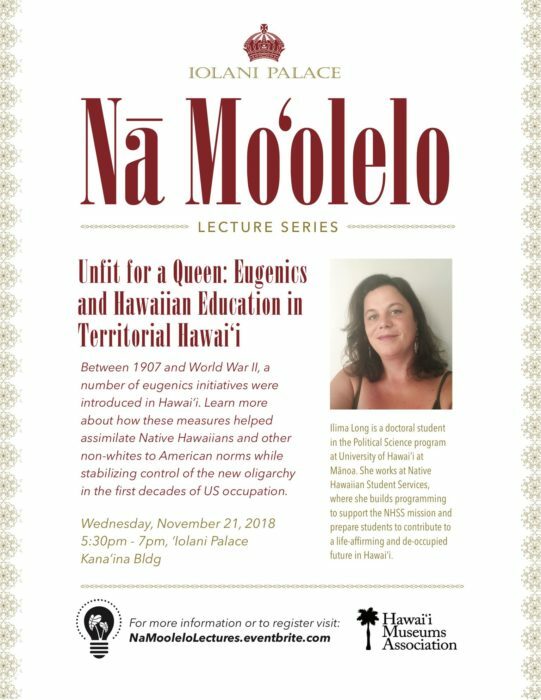 This is an important evolution in international criminal law and has a profound impact on the occupation of the Hawaiian Kingdom. Up until 1999, protected persons in the Hawaiian Islands excluded American citizens. But since 1999, the Tadic case has expanded protection to citizens of the occupying State who reside in the territory of an occupied State. The operative word is no longer nationality or citizenship, but rather allegiance that would apply to all persons in an occupied State. This is not to be confused with an oath of allegiance, but rather the law of allegiance that applies over everyone whether they signed an oath or not. Hawaiian law only requires an oath of allegiance for government employees. Under Hawaiian Kingdom law there is specific wording that covers allegiance. It is found in the Hawaiian Penal Code under sections 2 and 3 of Chapter VI for the crime of treason. 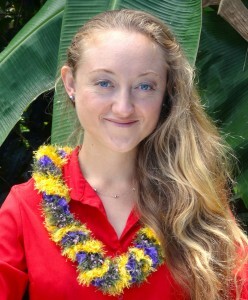 By expanding the scope and application of protected persons to American citizens residing in the Hawaiian Kingdom, they, along with all other nationalities of foreign States as well as Hawaiian subjects, are afforded equal protection under the Geneva Convention and can be considered victims of grave breaches or war crimes committed against them by American citizens in violation of the Hague and Geneva Conventions.